There are a number things that you should consider when it comes to hiring a professional landscaping company. At Booms Landcare, we’ve put together some helpful advice. First and foremost, you should think about what type of landscaping service it is that you’re in need of, and then you must seek out the right company for you. What Landscaping Services Do You Require? Landscape Architects – landscape architects plan and design your landscape. 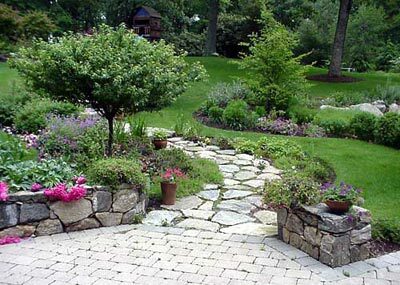 Landscape Designers – landscape designers perform a similar job to landscape architects. However, they tend not to have the academic degree that landscape architects have. Therefore, they can be cheaper to hire. Landscape Contractors – landscape contractors install your landscape features, such as soil, vegetation, fences, water elements, stones, and paths. Landscape Managers – landscape manager maintain your landscape if the job is too much for you to take on yourself. Horticulturists – horticulturists are plant experts and will advise on the best (and worst) plantation for your garden. Arborists – arborists plant, prune, remove, and take look after trees. They specialize in fertilization and nutritional needs. Once you’ve decided exactly what it is that you’re looking for when it comes to landscaping, conduct some research in order to find the best landscaper for you. Online is always a great resource, however, one of the strongest forms of marketing is word of mouth. Therefore, if a family, friend or neighbor has a landscape that you just adore, simply ask them for advice, tips, and help. If you’re all set and ready to reform your landscape, get in touch with our experienced team at Blooms Landcare. If you live in the Fort Worth area, simply pick up and call us at (817) 688-5352.